Khansaheb Civil Engineering has been appointed as the fit out contractor for the first hotel announced by Jumeirah Group under the Zabeel House by Jumeirah TM brand. DUBAI – January 29, 2018: Ishraqah for Development Limited, a leading UAE based developer, has announced its first hotel at The Onyx Project, located on Sh. 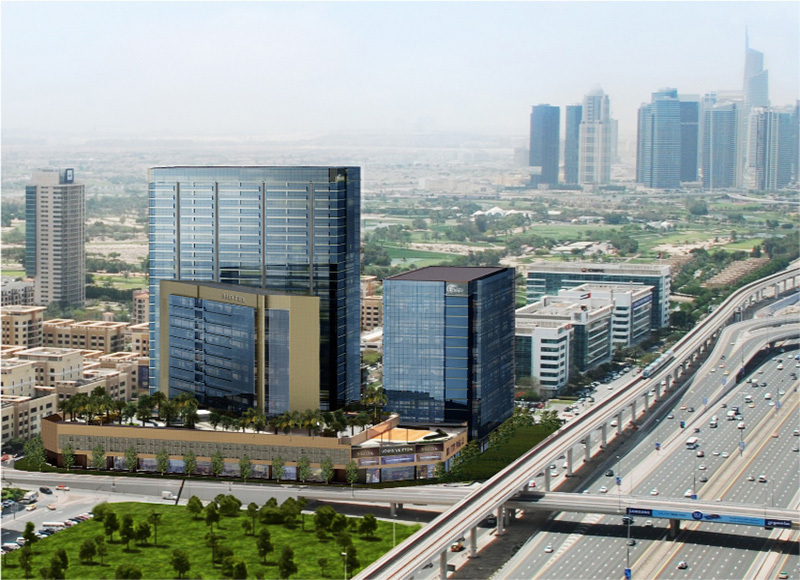 Zayed Road, in the Greens master development. The hotel is scheduled to open in quarter four of 2018. Zabeel House by JumeirahTM - The Greens is the first hotel to be announced under the Zabeel House by Jumeirah TM brand. The Onyx is Ishraqah’s prestigious freehold project, which along with the hotel, consists of residential and commercial towers and three levels of retail shops and restaurants in the podium, making it a key local community destination in Dubai. Khansaheb Civil Engineering, the leading contracting and fit out company in the UAE has been appointed as the contractor for the modern hotel which will be operated by the Jumeirah Group, a global luxury hotel company and a member of Dubai Holding, under the Zabeel House by Jumeirah TM brand. Zabeel House by JumeirahTM - The Greens will offer 210 guest rooms, two restaurants, terrace dining around the pool area, conference and business facilities, as well as a gym and spa treatment rooms. Designed to appeal to the curious traveler with an intrepid spirit, who wants to experience Dubai like a resident or uncover a different side of the city that they already know, guests at Zabeel House by JumeirahTM – The Greens can expect a four-star experience, brilliant basics and unexpected extras within an upscale, casual environment. The entire Onyx development is a stylish and premium mix use property witnessing a surge in demand over the last few months for commercial and residential spaces. With the announcement of Zabeel House by JumeirahTM – The Greens, The Onyx has gained further prominence in Dubai’s landscape. The hotel has great connectivity with easy access to Sheikh Zayed Road, and is within easy reach of some of Dubai’s best beaches, as well as public transport and the Dubai Metro. Anticipated to be a social hub for the locality, the hotel is also near Dubai Media City, Internet City, and the growing commercial district of Barsha Heights, which are the base for many media, IT and technology companies. The Onyx has a five-level car park - two in the basement and three on the podium, providing space for approximately 1,440 cars, exceeding the recommended international parking ratio. The development is equipped with 24 high-end elevators and a fitness center. Ishraqah was established as a strategic alliance between Al Zahran Group and Bin Mahfouz Group, two prominent Saudi business groups in 2006, to pursue opportunities in the regional and international property markets. Ishraqah and its sister companies currently manage a portfolio of real estate developments and investment of over AED 5 billion, in the US, UAE and Saudi Arabia, with offices in Dubai, Riyadh and Jeddah. Earlier in the year, Ishraqah had signed an agreement with Coldwell Banker, a global Real Estate brokerage. The agreement mandated Coldwell Banker UAE as the exclusive sales agent for The Onyx. With this exclusive partnership between both organizations, Coldwell Banker continues to lead the project sales for The Onyx. The prime development will also soon host leading brands including The Coffee Club, Al Maya Supermarket, French Bakery, Costa Coffee, MMI, Papa John’s, Desco, Al Fardan Exchange, Carving Board and 1004 Mart. Many other retail and F&B majors are also expected to open at The Onyx. Ishraqah was established as a strategic alliance between two prominent Saudi business groups, Al Zahran Group and Bin Mahfouz Group, in 2006 to pursue opportunities in the regional and international property markets. Ishraqah and its sister companies currently manage a portfolio of real estate developments and investment of over AED 5 billion covering the US, UAE and KSA markets with offices in Dubai, Riyadh and Jeddah. The Company’s prime objective is to be a dynamic, environmentally conscious and ethical organization committed to developing innovative and unmatched products to excel customer expectations. Ishraqah has always given top priority to innovation and quality with a clear focus of providing investment and home ownership opportunities to its valued customers. Jumeirah Group, the global luxury hotel company and a member of Dubai Holding, operates a world-class portfolio of hotels and resorts including the flagship Burj Al Arab Jumeirah. Jumeirah Hotels & Resorts manages properties in Dubai and Abu Dhabi, UAE, and Kuwait in the Middle East; Frankfurt, London and Mallorca (Spain) in Europe; the Maldives and Shanghai in Asia. Jumeirah Group also runs the luxury serviced residences brand Jumeirah LivingTM with properties in London and Dubai; the wellness brand TaliseTM; Jumeirah Restaurant Group DubaiTM; Wild Wadi WaterparkTM; The Emirates Academy of Hospitality ManagementTM; Jumeirah SiriusTM, its global loyalty programme; and isme by Jumeirah™ an app based rewards programme in the UAE. Future openings include luxury hotels in the UAE, Bahrain, Indonesia, China, Oman, Jordan, Malaysia and the Kingdom of Saudi Arabia. Exceptional, contemporary and modern, The Onyx promises a fantastic lifestyle experience. Apart from an excellent location and a wealth of amenities to support futuristic city living, The Onyx also accentuates the practical side of living, offering the convenience of having restaurants and cafes, as well as the right mix of retail shops and services, all a short walk away. In all, The Onyx sets to create a lively social scene that doesn't require a car to keep up. The star highlight of the development will be the 4-star hotel that will offer the right venue for special occasions. The Onyx strikes the right balance by featuring everyday lifestyle conveniences an elevator ride away.